Yak-130 during a demonstration flight at the MAKS-2013 Aviation and Space Salon in Zhukovsky. Russia’s state arms exporter Rosoboronexport has delivered armaments and military hardware worth over $10 billion to Latin America since it was established in 2000, Rosoboronexport Marketing Department Head Alexander Denisov said on April 27, TASS reports. The Rosoboronexport executive is heading the company’s delegation at the FAMEX-2017 international aerospace exhibition in Mexico. "This is a very substantial indicator of our successful work here, in this region far away from Russia, moreover, amid the tightest competition with the world’s basic arms producers, in the first place, the United States," Denisov said. Rosoboronexport is currently participating in some tenders in Argentina, Brazil, Colombia, Mexico and Peru for both ground-based armaments and aircraft, he said. Russian motor vehicles enjoy increased attention and demand in Latin American countries, Denisov said. "The same Mexicans actively used Ural trucks to eliminate the consequences of Hurricane Catrina [August 2005] when no other machines could be used to rescue the hurricane’s victims," the Rosoboronexport executive said. Latin American countries are also displaying interest in Russian aircraft, he said. 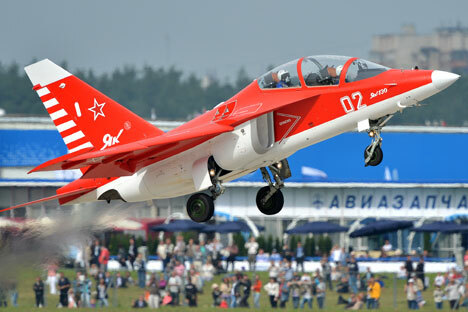 "Some Latin American countries have already sent their applications for the purchase of Russian Yak-130 combat training aircraft," Denisov said. The Air Forces of some Latin American countries "are also looking for ways to purchase MiG-29M, Su-30MK2 and Be-200 planes in Russia," although "not everything is as simple as one would like" in this direction, he noted. Over 500 companies from dozens of countries from all over the world are taking part in the Mexican aerospace exhibition, including Russia’s state hi-tech corporation Rostec, Russian Helicopters rotocraft manufacturer and Irkut Aircraft Corporation. Rosoboronexport’s exposition features over 160 items of Russian-made armaments and military hardware. The aerospace show will last through April 29.